The MEIXX Ultrasonic Aroma Essential Oil Diffuser is elegant and easy to use. Advanced ultrasonic vaporizing diffusion technology quietly releases a soothing fragrant mist up to 6 hrs. The MEIXX ultrasonic aroma humidifier does double duty. First, the humidifier function adds moisture to the air to help you sleep better, cough less and alleviate dry sinuses. This handy unit also diffuses your favorite scented oils without heat, Keep essential oil 100% natural without burning or heating. The is moist air that smells subtly fresh and clean. Colorful LED Night Light Mood light which can be set to cycle through 6 colors or fix on specific color, great for your kid's room and accompany them for a great sleep. 2. Oil is not included in the package. 3. To prolong the lifetime of the item,please keep it try and clean when storing. 4. If the ultrasonic wave chip was polluted, it may cause error action or default. 5. Please don't touch the internal ultrasonic wave vibration board inside of the water tank directly with your hands. 6. Please clean it once a week. 7. Do not use chemical essential oils which are corrosive. QUIET ULTRASONIC : Adopted the advanced ultrasonic technology, The voice is as low as 35db in the middle of the night, The Ultrasonic Aroma Diffuser moisturize your room quietly, No noisy voice and give you a peaceful aromatic environment, Especial suit for baby and bedroom. LARGE CAPACITY : This Aroma Diffuser can hold up to 400ml of water.So it is dual-used and can be used as a humidifier. When the water level is lower than the minimum limit, The diffuser will shut off automatically. 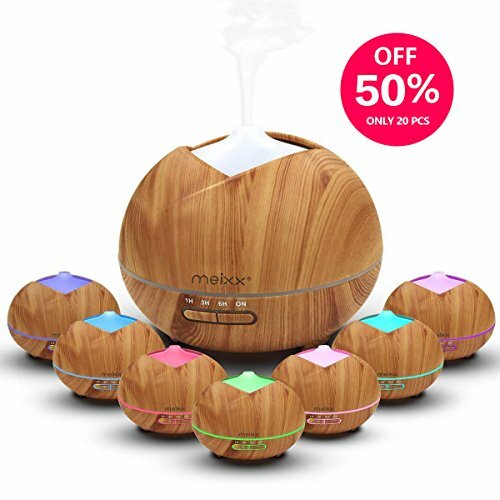 GREAT MIST OUTPUT : This Aroma Diffuser has two mist mode that runs up to 6 hours continuously or intermittently. He fog is concentrated, The emission area is wide, And the fragrance is easily detected. UNIQUE DESIGN : This Aroma Diffuser has a classic wood grain finish base (Anti-corrosion PP) , Which can be used as beautiful home decoration. PERFECT GIFT FOR YOUR LOVED ONES, It is also portable for yoga, office, spa, bedroom, baby room etc. If you have any questions about this product by Meixx, contact us by completing and submitting the form below. If you are looking for a specif part number, please include it with your message.